WHAT IS A GOOD EXPERT AND HOW TO FIND ONE? The experts are essential to our businesses, particularly those wishing to innovate. Innovation often requires, starting from market and customers’ expectations, to answer new questions. Experts have knowledge related to their education, experience and practice. They can therefore propose relevant solutions to these issues as they fall within their area of expertise. They are the embodiment of state- of-the-art in their field. Companies seeking to innovate need them. Unable to control all areas internally, these companies must learn, in our connected world, to seek external experts who can enable them move forward. It is this need that is addressed by innovation and expert detection platforms such as ideXlab’s. However, finding the right experts for a given domain doesn’t necessarily happen by itself. And besides, what exactly is a “good” expert? And how do we find one? We can illustrate our answer to the first question thanks to the Venn diagram in the figure below. Experts who can answer a question asked by a company must have three qualities: be competent, of course; be available to interact therewith; be open to adapt their competencies to the company’s issues. Availability. It often happens to find an expert who seems ideal on paper, but not available: he/she doesn’t have time or simply doesn’t feel like getting involved. This crippling lack of availability reduces the expert to a phantasm for the seeker. Einstein in his time would certainly have brought joy to hundreds of companies but he was too busy to devote time to them. Nowadays, certain university professors, for example, who are authorities in their field, won’t have a minute to spend for companies searching for answers. Openness. Certain experts also lack the openness needed for this type of exercise. It is really rare that the question asked to overlap exactly the areas mastered by the expert. The expert has to carefully examine the issue prior to tailoring its response to the context of the company, also to show empathy and listening. He/she may have to agree to add other competencies, for example to industrialize his/her solution. Otherwise, he/she will propose a dogmatic and theoretical answer which will be eventually difficult to integrate within the company. These qualities, which are often found in this population, however, are not systematic. Competency. Finally, the proliferation of open platforms allows everyone – both experts and non- experts – to propose solutions to problems, thus making it possible for curious and available individuals to offer their services. Unfortunately, their proposals are often a waste of time for the company at the origin of the issue, as they don’t have the depth needed to provide real added value. Moreover, the competency is based on knowledge which is not absolute and may be controversial: a reputable real knowledge at a given time can, for example, be rebutted by the advance of science. It is therefore recommended not to engage with only one competent expert, but with several. 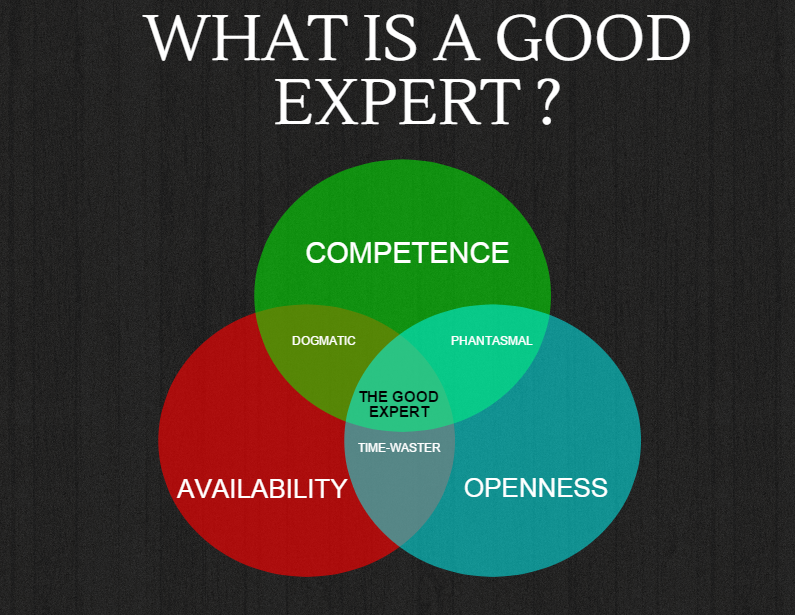 The “good” expert thus meets these three qualities: availability, openness and competency. How to find the ‘good’ experts? On the ideXlab platform, we take into account the three qualities mentioned above. Firstly, the competency is ensured by the analysis of digital footprints left by the experts we seek. These digital footprints, for example, are the fruit of scientific publications (reviewed by peers) or patents (reviewed by trained patent experts) that guarantee a high quality content. The competency of our experts is evaluated automatically by our algorithms and takes into account the bibliometric data and their social network environment. Secondly, the availability: we contact simultaneously several experts who are carefully selected, but rarely solicited because of their overall number (we estimate we can contact more than 10 million experts worldwide) and the accuracy provided by the analysis of our algorithms. Too many platforms now contact too often the experts they have in their database. The quality of their responses deteriorates over time. The experts who meet the demands of ideXlab do so because they are interested in the question they are asked, and because they feel able to provide the resource for answering or contributing. Others – not interested, not available – don’t bother to answer and that’s fine as well! Finally, the openness: we calibrate our expert engagement campaigns to systematically interact with several of them in order to ensure a diversity of responses or opinions. The interaction facilitated by the platform also allows to very quick understanding on the basis of simple questions, the degree of the expert’s openness of and his/her ability to adapt to the context of the company. The “good” expert is the rare resource of the innovative and competitive company in the 21st century. Fortunately, current technology allows for easy identification and linking. This is a significant step forward towards a more rewarding and effective collaboration between industry, academia and the world of experts in general.